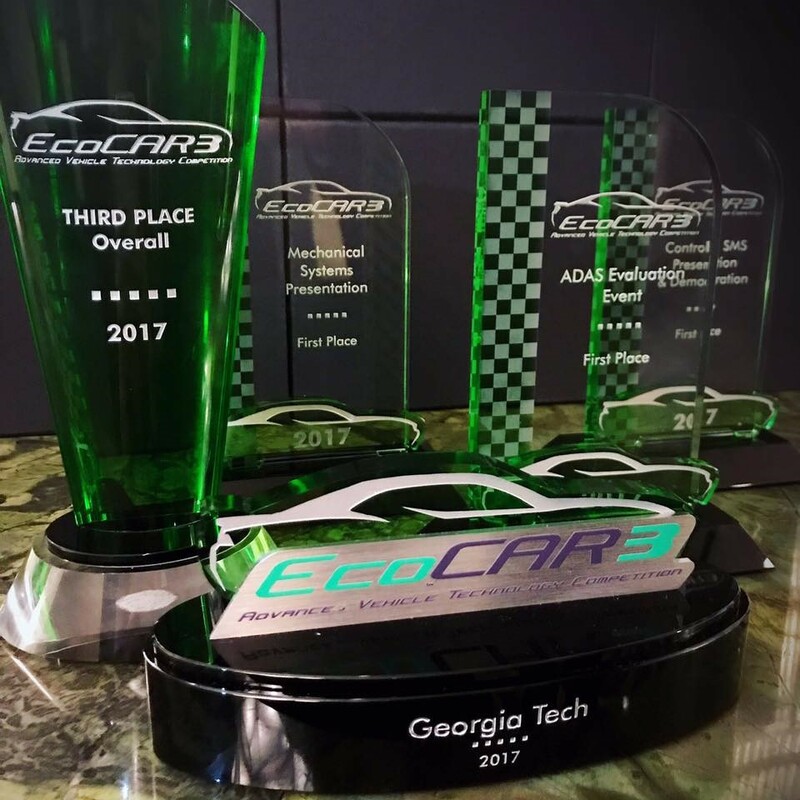 Each year, Georgia Tech sends a team of engineers to prove that they have designed the fastest, most environmentally-conscious car possible as part of the EcoCAR 3 competition. During the third year of the challenge, the College of Engineering’s team was awarded third place overall and second in the technical category. 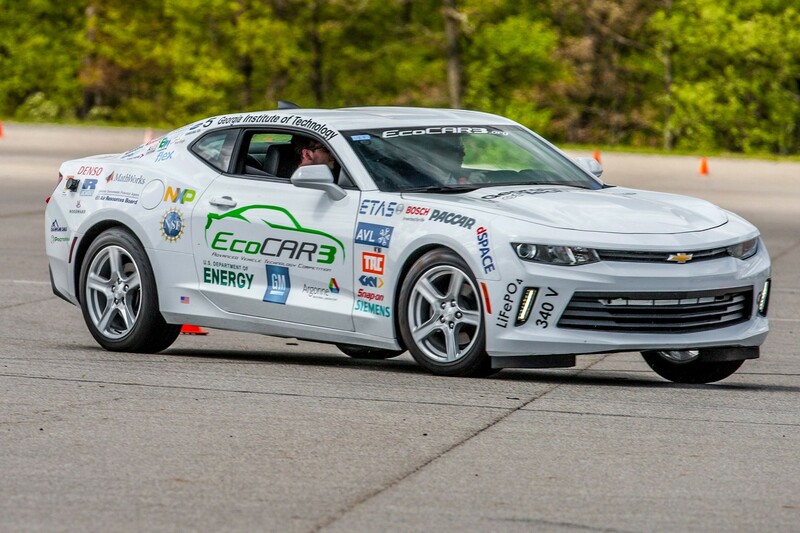 Through this competition, sixteen universities compete to redesign, build, and drive a Chevrolet Camaro that has a reduced environmental impact while still retaining the car’s speed, iconic look, and high performance. Georgia Tech’s sixty-person team, made up of master’s and bachelor’s degree students from mechanical, electrical, and chemical and biomolecular engineering majors, sent twelve representatives to the third stage of the competition. During this year’s challenge, the team brought their prototype to Michigan for the first week-long stage, where the vehicle was subjected to safety and technical inspections that allowed it to qualify for the road test. They also participated in an autocross event, where they demonstrated the car’s ability to handle real-world driving situations. Stage two of the competition was held in Washington, D.C. from May 21 to 25, where Tech’s team formally presented their prototype through presentations, demonstrations, and further testing. Georgia Tech’s team was one of only four to complete an over-one-hundred-mile endurance test in order to measure efficiency and emissions. They were the only team to complete it on the first try. They also were awarded best mechanical presentation, best system modeling simulation and controls presentation, and best demonstration of advanced driver assistance systems. Their various awards have them taking home $12,000 in prize money, which be put to use for next year’s round of the competition. For the past three years, the team has been creeping up in its rankings; last year, they placed ninth overall, and in the first year they placed fifteenth. The four-year-long EcoCAR 3 competition is a U.S. Department of Engineering and General Motors Advanced Vehicle Technology Competition. During the series, the students have come up with a plan for research and development, analysis, and validation of the vehicle design as they integrate powertrains and alternative fuels.